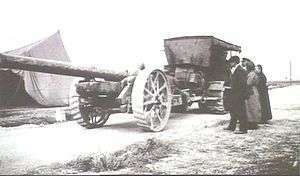 The British BL 6 inch Gun Mk XIX[note 1] was introduced in 1916 as a lighter and longer-range field gun replacement for the obsolescent BL 6 inch Gun Mk VII. The gun was designed and built by Vickers specifically as a field gun, unlike its predecessors which originated as naval guns. Its length was reduced from the 45 calibres of its naval gun predecessors, to 35 calibres, to reduce weight and improve mobility. It utilized the modern carriage and recoil mechanism of the BL 8 inch Howitzer Mk 6. The gun barrel was of wire-wound construction: "The gun body is of steel and consists of tubes, a series of layers of steel wire, jacket, breech bush and breech ring". "The breech mechanism is operated by means of a lever on the right side of the breech. On pulling the lever to the rear the breech screw is automatically unlocked and swung into the loading position. After loading, one thrust of the lever inserts the breech screw and turns it into the locked position. The breech mechanism is similar to that used on the 8 inch howitzers both in design and operation". Gun built in 1918 and bought for coast defence by the Brazilian Army in 1940, now on display at the Museum of the History of the Brazilian Army at Fort Copacabana in Rio de Janeiro. 310 were built during World War I and the gun served in all theatres, with 108 being in service on the Western front at the end of World War I, but it did not completely replace the Mk VII gun until the end of the war. "The original British ammunition so closely resembled the American that it was decided to use the [US] regular Mark II high-explosive shell... the propellant charge will consist of a base section and increment section having a total weight of approximately 25 pounds". Brazil purchased these guns from USA in 1940 for coastal defense. Prior to the outbreak of World War II there were plans to use these guns in the fortification of Durban, Cape Town and Saldanha Bay. For a short period, two guns were deployed for the protection of Port Elizabeth harbour at the outbreak of World War II. A gun bought by Brazil from USA in 1940 is displayed at the Brazilian Army museum, Copacabana. 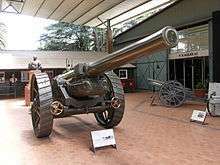 A Mark XIX mounted on a Mark XIII carriage can be seen at the South African National Museum of Military History, Johannesburg. The Apostle Battery in Hout Bay, South Africa has another on display. A gun on display at Signal Hill, Cape Town, South Africa. ↑ I.e. Mark 19 : Britain at the time designated Marks (models) of ordnance using Roman numerals. This was a field gun and field ordnance normally used a different Mark series to naval ordnance, but unusually the next available Mark number in the 6-inch naval gun series was used, rather than Mark I as the first 6-inch BL field gun. ↑ Lt Col Ian van der Waag. "A brief military history of the Saldanha Bay area". University of Stellenbosch - Saldanha Campus (Military History Department). Archived from the original on 25 June 2007. Retrieved 2008-07-12. ↑ Richard Tomlinson. "Artillery Buildings in Algoa Bay". The South African Military History Society. Archived from the original on 9 May 2008. Retrieved 2008-07-12. ↑ "Military History Group". Hout Bay & Llandudno Heritage Trust. Archived from the original on 22 September 2007. Retrieved 2008-07-12. Wikimedia Commons has media related to BL 6 inch Mk XIX gun.